Heart-shaped “Heartbeet” Ravioli is a delicious, whimsical recipe. 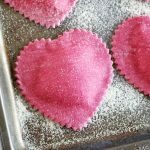 This pink beet ravioli is filled with a goat cheese and ricotta filling and is perfect for Valentine’s Day! Make the ravioli filling. In a medium bowl, stir together the softened goat cheese, ricotta, rosemary, thyme, Parmesan, egg, salt, and pepper. Cover and refrigerate for at least 1 hour or up to overnight. Make the pasta dough. Using a standing mixer with the dough hook attachment, whisk together the flour, semolina, and salt in the bowl. Whisk together the olive oil, eggs, egg yolk, and beet puree and add to the bowl. Mix until the dough comes together in a ball. Transfer the dough to a lightly floured surface and knead until smooth, about 3-5 minutes. Divide the dough in half, wrap in plastic, and let rest in the refrigerator for 1 hour. Roll out the pasta dough using a pasta machine. Divide the dough into half again to create 4 equal parts. With a rolling pin, roll the dough into a rough rectangle. Transfer through the pasta machine, beginning at the widest setting and ending at the thinnest. Keep the pasta you are not using covered to avoid it from drying out. To assemble the ravioli, lay one sheet of pasta dough on a lightly floured surface and brush with egg wash.
Drop a heaping tablespoon of the filling across one sheet of dough, 2 inches apart. Lay another sheet of pasta dough on top, and gently press around each mound of filling to let out any air pockets. Using a ravioli cutter, cut out the ravioli shapes and press to ensure the edges are sealed. Sprinkle the formed ravioli with a dusting of semolina flour to prevent sticking. Cook the ravioli in salted, boiling water until al dente, about 8-12 minutes. The ravioli will float to the top when ready. Serve the ravioli with olive oil or nutty brown butter and fresh herbs. *To make beet puree, you can either cook beets in boiling water or roast them in the oven until tender. Once tender, peel the beets and puree them in a food processor until smooth. Measure out 1/4 cup. You can either cook the ravioli immediately or place them on a semolina-dusted baking sheet, cover tightly with plastic wrap, and refrigerate overnight. You can re-roll scraps of the pasta dough once to create more ravioli if needed.